Our final single-camera show of the tour. I’m sure we’ll all be devastated to see them go. In saying that, KUSHIDA vs Dragon Lee and Hiromu Takahashi vs SHO isn’t a horrible way to say goodbye. El Desperado introduced Sabin to his brawling ways pretty quickly. Having made his entrance first, he decided to hide, attacking Sabin from behind as he came through the curtain. He then dragged the Motor City Machine Gun down to ringside and into the chairs while the ref watched on hopelessly. I hope New Japan doesn’t pay them too much, they’re not very good at their jobs. Eventually, Sabin was able to escape Despy and begin wrestling his match, creating a bit of distance and hitting that lovely Springboard Tornado DDT that he does. However, he couldn’t resist getting revenge and Desperado fell to one of his own tricks as it was his turn to be sent tumbling into the chairs. Sabin was playing Desperado’s games, and it could have proved his downfall. Except, Chris Sabin isn’t some naive rookie to be taken advantage of, Desperado got the ref out of the way (not entirely sure why he bothered) and looked to use a chair. However, Sabin was there to Superkick it back into his face. A Shellshock later and he’d put the bully down for good. Considering both of these men are mathematically eliminated from the tournament, they put a lot of effort into this one. They told a compact story and took a few big bumps, destroying the crowd’s seating arrangement at the same time. Fair play to them. You probably don’t need to read a review of this match. If you have ever seen Scurll and Taguchi wrestle, then you know what it was. You’ll also know whether you’re likely to enjoy it or not. I fell on the enjoyment side of the fence. Scurll and Taguchi relied on their shtick, but they’re good at their shtick, and it can be fun. Plus, they threw a couple of new things in there. Towards the end, Scurll went for what looked like a Pumphandle only to have Taguchi clamp his thighs around Scurll’s hand, making it look like he’d hit a low blow. It was a twist on the Eddie classic and got a legit laugh from me. To top it off, they had decent chemistry when they got going. Their unusual styles meshed well with both men looking to pilfer tricks from the other’s playbook. In the end, Marty proved he’d done his homework as he loosened off his boot. That allowed him to slip out of the Ankle Lock and score a roll-up for the three. The Villian’s brain proved to be the deciding factor. While I know these two have been involved in the feud over the Junior Tag belts, it was still a surprise to see them go at each other like mortal enemies. Maybe Takahashi was annoyed that SHO attracted the attention of Dragon Lee? They also wrestled like they’d been working together for years. Both men are bursting with charisma and have similar styles that blend power moves with death-defying insanity. It didn’t take long for them to be laying into each other with little care for how they’d feel when they woke up the next day. In among that insanity, SHO was focusing on Takahashi’s arm, and I have a slight issue with that. He’s been doing it all tournament and yet he still hasn’t won a match with the Armbar. If he’s going to make it a regular part of his game I want him to make me believe that it can help him win the same way Takahashi has with D.
This probably isn’t the place to focus on that, though, because it takes away from SHO and Hiromu trying to murder each other. When they started dishing out Germans, I started flinching, and when SHO moved onto the Triple Powerbomb, I was watching through my fingers. That’s not how necks are supposed to be treated. The finish came from Takahashi having that little bit more in the locker than SHO. He was able to escape Shock Arrow before transitioning from a Hurricanrana into D. SHO almost powered out, getting Takahashi up for one Powerbomb but the impact wasn’t enough to shake him off, and when he tried to do it again, he failed. The only thing he could do was tap. If SHO keeps this up, he might have to be accepted into the Dragon Lee and Hiromu Takahashi love club. You can tell we’re approaching the end as the wrestlers have tightened their boots again. Dragon Lee and KUSHIDA started with a simple story, yet as they went on it morphed into something a lot more interesting. To begin with, we got a battle of who could dictate the match style. KUSHIDA was looking for submissions while Dragon Lee wanted to create distance and take to the air. Both men were having their moments, but neither was quite able to do enough to fully take control. Then, the dynamic started to shift. 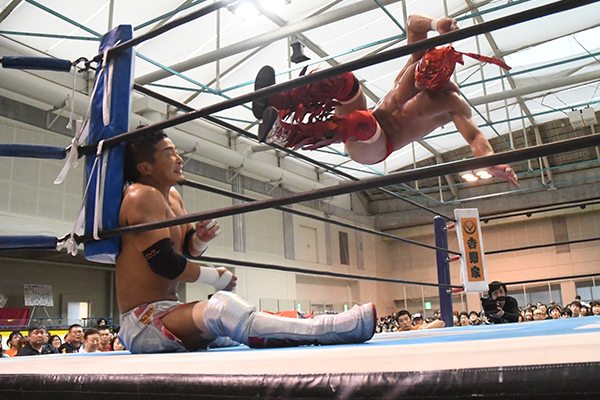 As Dragon Lee frustrated him, KUSHIDA was forced to take flight. While that’s always been an element of his game, he was going to the air much more often than we’ve come to expect from him and getting results. So, Dragon Lee responded by tying him up. At one point, he was mounted on KUSHIDA’s back, holding onto both his arms and forcing him to reach the ropes with his teeth. In a beautiful piece of storytelling, these two had managed to twist their original tale on its head. The final minutes were unsurprisingly exquisite. Two masters of their craft going back and forth at top speed, pushing each other to the next level until KUSHIDA hit Back To The Future for the win. This was a wonderful match. After a bit of a lull Back To The Super Juniors kicked into top gear again as we enter the final stretch. Scurll vs Taguchi won’t be for everyone, but everything else on this card was good to great. At the very least make sure you catch the final two matches.